only a handful of people know. it's just a little one. but it's big to me. i've been keeping it under wraps because i'm trying to keep my excitement under control, you know... just in case. *deep breath* ok, here i go... WE'RE IN ESCROW!!! yep, it's true. we are. but anything can happen so i am not fully allowing my heart to get all cozy in a new house, or work out every detail... until every detail is worked out. but i am a little excited. and one way of knowing is by taking a closer look at my Pinterest boards. i have wanted to own a home for probably my whole life, and if not that long, at least as long as we've been married. i can't help myself, so i'm going to let you in on the little ideas i have for some changes to eventually be made, Lord willing. for this post i will show you the existing kitchen and breakfast area and some of my inspiration for it. the home was purchased by investors so they put all new tile in the entryway, kitchen, and laundry room. it's very nice but i would love to have hardwood floors one day. the kitchen is smaller than our existing rental property, so i will have to be strategic with my organization. 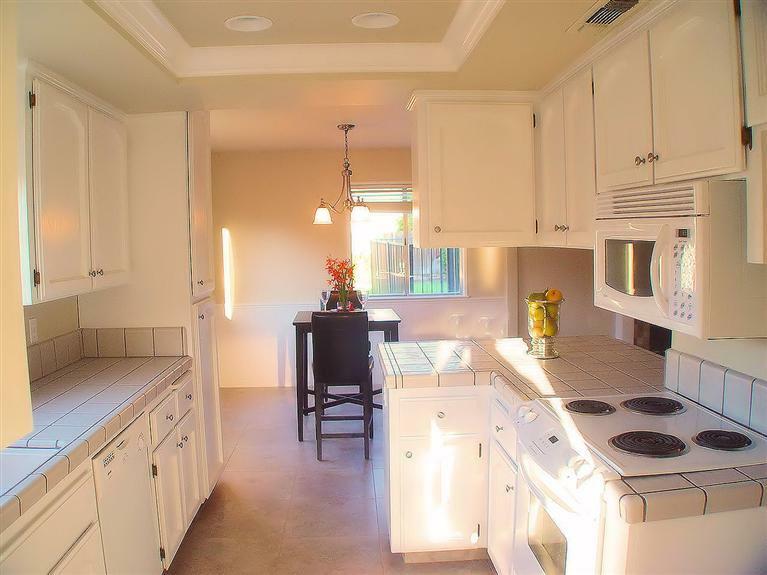 i love the white cabinets and inset ceiling. another thing to change, way down the line, would be the counter tops. not my fav. but they work just fine. one thing i would love to experiment with that would cost almost no money, and i think would open up the tight space of the kitchen, would be to take all the top cabinet doors off and leave them open. i could either paint the inside or add bead board to the back. depends on funds. it also would be nice to remove the existing cabinets over the bar to open it up into the family room, but that would take away so much precious storage. breakfast area, view from the family room. see what i mean about those cabinets blocking off the kitchen from the bar? i do love the bead board along the wall of the breakfast area. we only have one dining room table, and it's a biggin' (8-seater rectangular table) so that will have to go in the formal dining room. eventually i would like to put benches in along the corner of the breakfast area to make it more nook-y and get a round pedestal table and chairs to allow for more seating and added storage. another thing that would be nice would be to remove the pantry and extend the counter area, but then where would i put all my nuts and berries? ok, so here is what i found on Pinterest. the possibilities are endless and i LOVE the inspirations. eek! i know the pictures are small, but you get the idea. 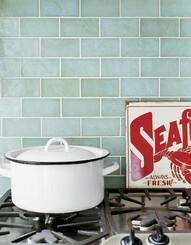 love the colors and the butcher block counters. i also like the idea of adding a shelf over the sink, but there is a window over our sink and i can't remember how far up it goes. might not be room. this whole kitchen is a dream. 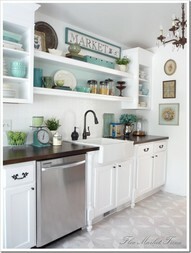 i like the little brackets under the cabinets and the touches of green. this just makes my inner organizer so happy. so so happy. 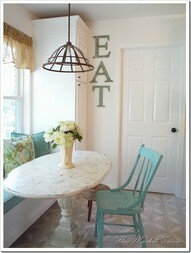 nook: cute old oval table, blue chairs. i like the EAT letters too. benches flanked with pantry cabinets, solution? LOVE this table. but not in this color. i also love the shades. 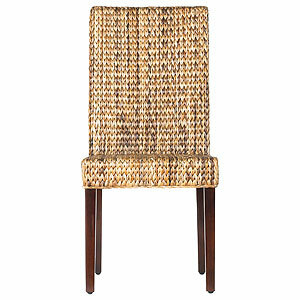 if i did a colored table instead of colored chairs i like the idea of getting some woven banana leaf chairs, or wicker? shelves above the windows in the corner? or too busy? I LOVE SERENA & LILY PILLOWS! i also love striped bench cushions. dudes. my style is all over the place. someone help. ok, now the cat is out of the bag. we are holding this house with an open hand. we only want it if it is the Lord's will and if something comes up (like the in ground pool in the backyard (!) will make our water or gas bill $500... or the inspection uncovers a need for all new plumbing) then we are content with still renting... even if it is noisy. are you excited? well, stop it. Yay Tar!!! Thanks for sharing!